The Navajo, also known by their preferred name, the Diné, are the largest federally recognized Native American tribe in the United States. Their reservation is spread out throughout the Four Corners region of the American Southwest, and includes portions of the states of Arizona, New Mexico, and Utah. The Navajo base their way of life on a belief that the physical and spiritual world blend together and everything on earth is alive, related, and in equilibrium, also known as ho′zho′. In this light, the Navajo observe two primary ceremonials, among many others. The first is the Blessing Way, which keeps them on the path of wisdom and happiness. The second is the Enemy Way, which is meant to discourage evil spirits, eliminate ghosts, and cleanse an individual of elements or affects that have placed her or him out of balance. "Jane Biakeddy and grandchildren, 'I live on the wrong side of the fence,' 1987," photograph by Lisa Law. Lisa Law Big Mountain Weaving Project. Center for Southwest Research, University of New Mexico. A01 The Blessing Way (01-07) p.
1994 Navajo: Walking in Beauty. San Francisco: Chronicle Books. 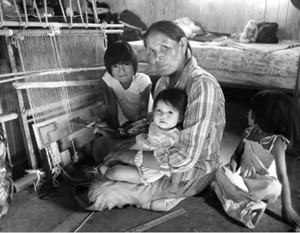 2001 Navajo Land, Navajo Culture: The Utah Experience in the Twentieth Century. 1982 Modern Navajo Witchcraft Stories. Navajo Religion And Culture : Selected Views.